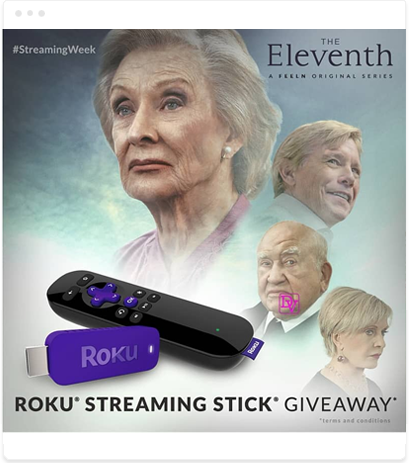 Hallmark Channel had a three part communications strategy: (1) generate awareness and excitement for their new television series, “The Eleventh”, (2) promote special subscription offers tied to #NationalStreamingDay, and (3) amplify key messaging points on the unique attributes of their channel. They also had a very specific demographic target to reach through social media - 45+ year-old women living in the Midwest of the U.S.
Blog Meets Brand had a series of brainstorming sessions with Hallmark Channel where we devised a succinct content strategy enabling different influencers to focus on different parts of the three part communications strategy and all to cover the three points in their blogs and social media posts. Our team ensured both that the messaging of Hallmark Channel was effectively communicated and also that the influencers retained their own voices and creativity. Through our technology and team, we found optimal influencers that reached the client’s target audience.